RueBaRue is a LiveRez Partner, and we'd love to work with you! We help you create beautiful mobile friendly guestbooks for your area and your properties in minutes. Say goodbye to brochures and hello to the future. "We want to give our guests the whole experience, not just the house key." "People want that local experience when they come here. Our RueBaRue guides help us provide that." "It's nice to have something that I can send out when people book so I can help them plan their vacations in our town." Our unique Guest Experience Platform makes it easy for you to create customized, information-filled guides you can plug into your website with a single line of code. 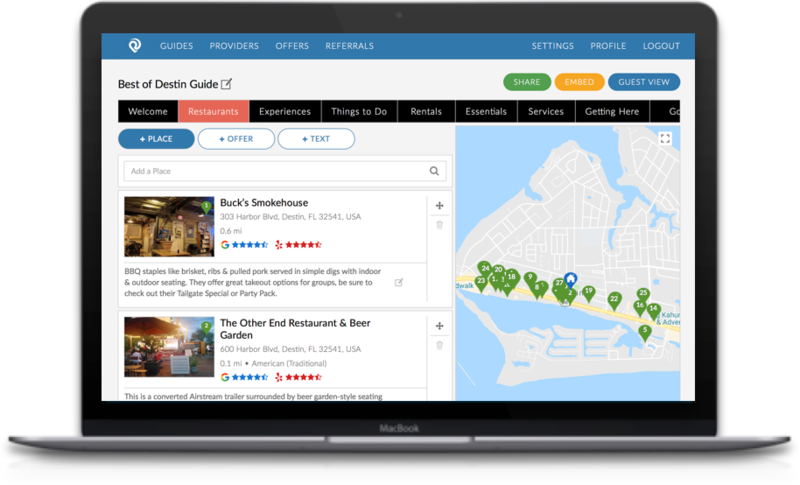 Give your guests all they need to know about the best restaurants, activities, events and essentials in your area. Start with basic information provided by our search algorithms, then customize it as you please. The guides update automatically. Provide the essential information your guests need about their rental home like arrival times, WiFi codes and rules for maintaining the house. The property guide shares the Guest Experience Platform with the destination guide, so guests can access both from their phones, tablets and computers. Together they form the perfect guestbook with all the information your customers need for an enjoyable stay. 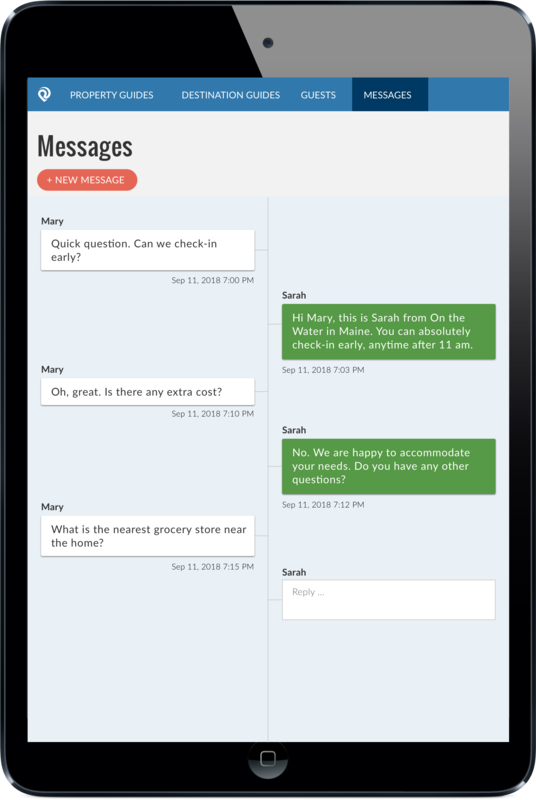 Answer questions from your guests before, during and after their stay with mobile messaging. Our two-way chat feature lets guests ask questions like the location of the nearest grocery store, whether late check-out is possible or the WiFi password and receive an instant response from your or your team by text. Messaging works on personal mobile devices. No additional equipment or installation is needed. Meet some LiveRez Partners using RueBaRue. 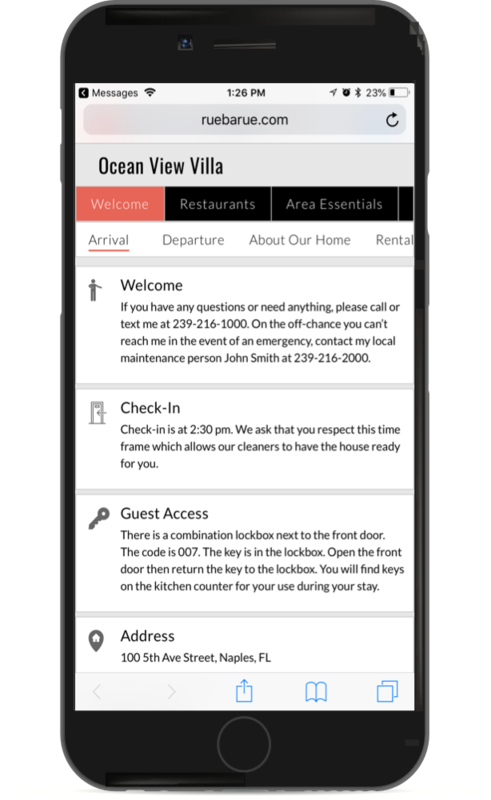 All information your guests need about their vacation home and the area is on their mobile devices and updates automatically, so there's no need for clunky binders, brochures and photocopied instructions that easily become dog-dog-eared and outdated. Our smart messaging feature means you or a team member can reply to guest questions instantly by text. All messages are stored for review if necessary. With a dedicated phone number for your business, guest messages won't come in on your personal phone line. The guestbook's destination guide showcases unique local experiences that create memorable trips and make guests want to return. Our search algorithms do the heavy lifting, finding high-quality content in your area that you can customize as you please, complete with recommendations and tips. Our platform lets you schedule the dates you want your customers to receive their guestbooks. Guestbooks will be sent automatically by email or text with a customized welcome message from you. Include your messaging phone number so guests can ask questions before they arrive. Major hospitality brands like Marriott and Airbnb are rolling out guest experience platforms, destination content and mobile messaging. Don't get left behind. An all-purpose guestbook and mobile messaging will enhance your guests' experience. They can assist guests planning their stay, help their vacation run smoothly and convince undecided guests to rent. Share them with new and existing customers in promotional newsletters, emails and blogs.